Day 4 of the study tour. With a departure from the hotel at 07:20 – on time and in full – having had breakfast and packed up our bags, you would have expected us to have been exhausted. The last day before we headed home, you would have expected us to have been feeling low. But, you would be wrong! And why is that you ask? 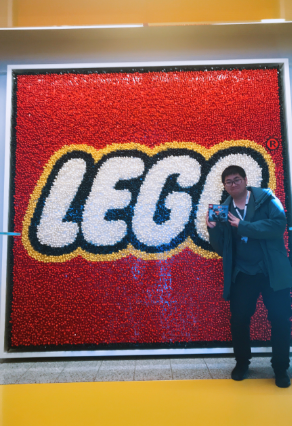 Because we were on our way to Lego HQ! We had been waiting all of our whole lives for this moment and the bus was alive with excitement (apart from when Emel looked back to speak to us and couldn’t find a single person awake – it was 07:30 in the morning remember and Denmark is an hour ahead of the UK, so technically 06:30. Give us a break). Anyway, by the time we got off the bus at Billund an hour later, we were raring to go. We were each given our guided tour passes on entry to the building and promptly taken to a presentation room where we were introduced to Tine. We were fascinated to hear all about a family run business, which was established in the 1930s on the back of the recession making wooden toys and reported an operating profit of DKK 10.4 billion in 2017. This year marks the 86th birthday of Lego. They are currently building a new HQ at the back of the current one which will cover 50,000 m2 for 2,000 employees but its not just any HQ, it’s one with slides and mini golf inside! We were shown a film explaining how Lego came to be. 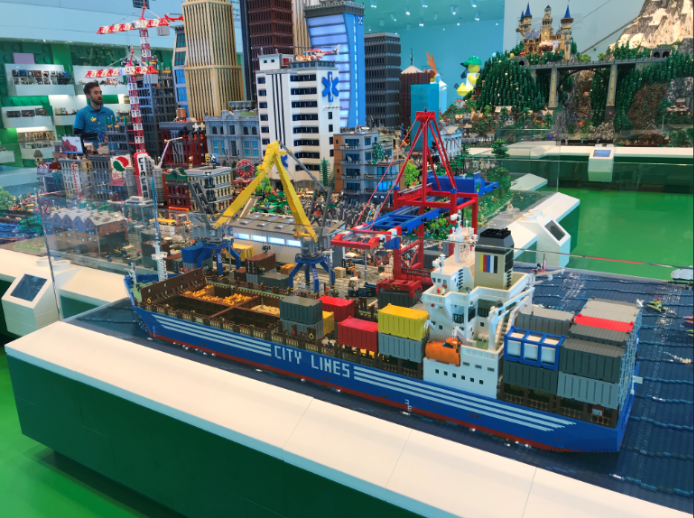 Ole, the founder of Lego, wanted to create the best play and learning experience around the world. Currently, Lego is sold in 140 countries with the largest markets in Europe and North America. Employing 17,500 people, the core values of the company is quality, creativity, imagination, learning, caring and safety. They also have mini HQs in Boston, London, Singapore and Shanghai with DCs in Mexico, Czech Republic and Shanghai. Lego have faced many challenges. In their 86 years, they have suffered from 4 devastating fires. They have faced strong competition from the likes of Hasbro’s board games and Mattel’s Barbie. In the 90s they met their toughest few years when they faced closing their doors for good. This difficult time also coincided with the introduction of the Gameboy. 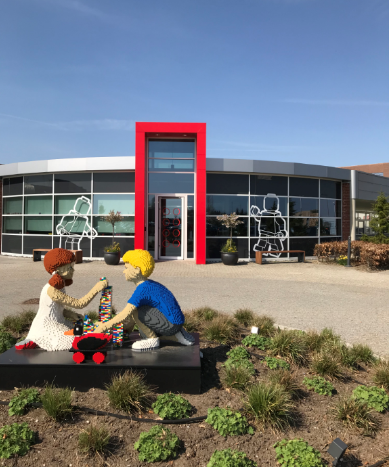 To prevent the closure of Lego, Kjeld, Ole’s grandson, invested all of his own money to keep the afloat in 2003 and for the first time ever brought in a new CEO from McKinsey consulting to help get Lego back on track in 2004. 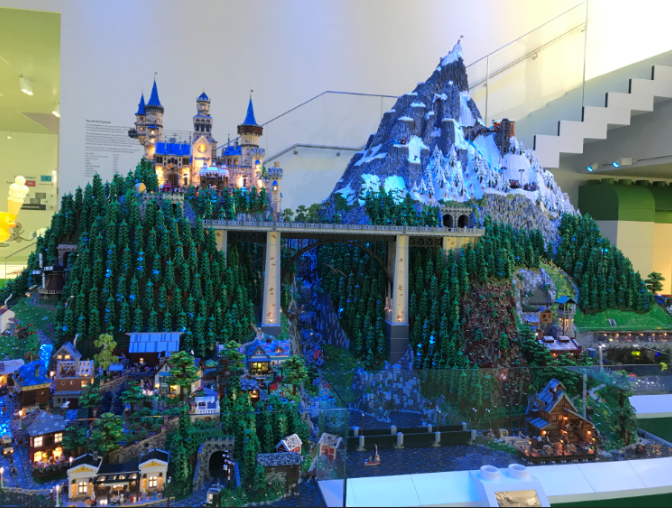 At this time, Lego began to break with tradition and make stationary, books and clothing. During the presentation we were hand little bags which consisted of 6 pieces of Lego. Everyone was given exactly the same pieces and we were told within 45 seconds we had to build a duck. Of course, everyone went mad. We built some of the most random looking birds you have ever seen. But as we were told, this proved that we all have such brilliant imaginations. After a short break we heard from Henning De Hass, the director of Supply Chain development. The theme to his presentation was the challenges that Lego currently face. They have a lot of risk in forecasting their demand. We heard about their operations. When a shop runs out of stock, it is automatically replenished, and this typically requires same day or next day delivery. We discussed their Distribution Centres and the physical network design – Nicky would have been proud. We concluded that we like the way they have organised themselves, in a way that makes the most sense. They operate local distribution centres and also ecommerce fulfilment centres. With ecommerce being ever more popular, we talked about whether this network would need to look differently in the future. Then we talked about market trends and disruptors. How would blockchain impact Lego, what could be done with artificial intelligence, and were drones the way forward? They were currently working with 3D printers in Texas, something that had been a huge hit in stores. We considered whether this could be scaled to make an impact on the current supply chain. We broke into small groups and considered different ideas before presenting back to the class. As a reward we were all given our own Lego packs! After all that hard work, we were spoiled with a beautiful spread for lunch. So, we refuelled before heading back to the bus and over to the moulding factory. Arriving at the factory we were suited up in high vis and given individual headsets in order to hear Tine. In order to keep Lego so competitive, everything is a secret and so no phones or pictures were allowed. The factory was unreal. Fully automated, we walked along the building which has been extended and added to multiple times over the years and is now half a km in length – what a work out that must be on a shift! Fully automated, the factory is unbelievably clean, included the boxes which the Lego goes into for storage as they all go through a large dishwasher! They utilise high bay storage which is 37m in height and stores boxes randomly. Lego figures, which are now the largest population on earth, are created 7,000 times every hour and 50,000 boxes are packed every 24 hours. Lego even holds the world record for being the largest tyre producer, something I’m sure the likes of Pirelli would dispute. 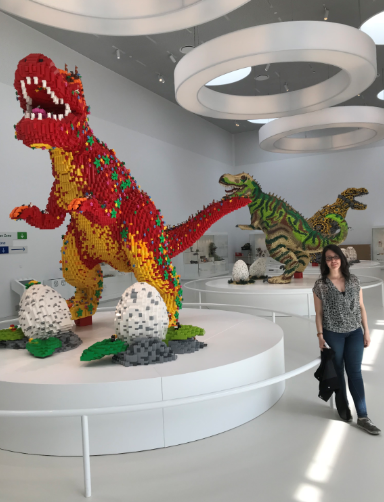 There are currently 13,500 variations of Lego pieces and the facility at Billund has the ability to store 124,000 boxes of Lego. Getting back on the bus, we made our way to Lego House which is open to the public. We had a few hours to explore before leaving for the airport. After browsing the gift store for the 3rd time, many of us headed back to the bus for some shut eye. 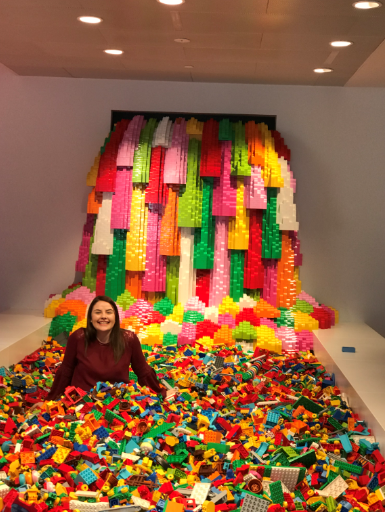 Paola and I booked to go on the Lego House tour and we didn’t regret it! We were guided through each area which is built for specific things such as social skills, creativity, cognitive skills. We had a chance to complete a challenge with robotic Lego cars, swim in Lego (literally!) and build a fish to then be scanned by a 3D scanner and displayed on a television aquarium. 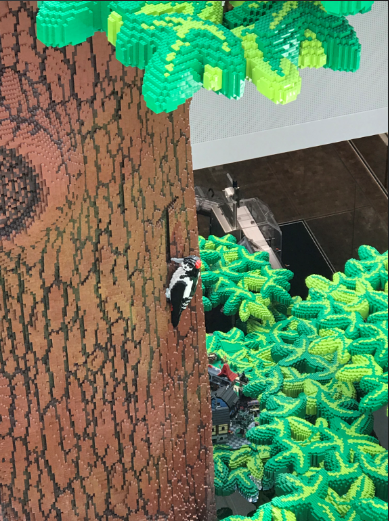 We heard all about the Lego tree of life which is 15m in height and displays special edition of Lego on the different branches as well as each of the family owner’s names ‘carved’ in the tree trunk. There is a woodpecker posed to be carving the intial ‘T’ which represents the next generation and Thomas, soon to take over. We heard about the restaurant in the house which given you Lego bricks when you arrive so that you build your order. Once you have designed your plate of food, you place it in the ‘microwave’ which is really a 3D scanner. Your food is then made for you and delivered by robot straight to your table. Dumbstruck with amazement, Paola and I ran from the Lego House back to the bus, just in the nick of time for the bus to leave. There may have been a slight mishap where we left on time but not in full. Not to worry though, as Logistics students, we quickly arrange to pickup our wayward Steve and we headed to the airport. We arrived back to the UK on Thursday night to rain – on time and in full – but with some amazing stories to tell. After a fantastic 4 days we had seen a high bay the size of a football field, tried and tasted multiple beers straight from the tank, walked through the factory of the largest packaging company in the world, seen first-hand a Danish pastry baked from scratch and toured the top-secret Lego HQ. We would definitely be sleeping all of Friday. Ps. Did you know that six 2 by 4 Lego bricks could create 915 million different combinations? The mind boggles. Over and out from #TeamDenmark!